Surrounded by parents, students, fellow teachers and reporters, teachers from Chicago's Drummond Elementary School proudly announced on the afternoon of February 28, 2014, that they were joining their fellow teachers at Saucedo Elementary School in boycotting the ISAT (Illinois Standards Assessment Tests) testing program. The ISAT is scheduled to begin the first school day of March -- March 3, 2014 -- in all Chicago elementary schools. 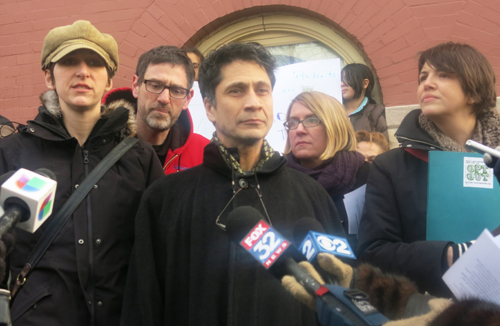 Teachers and parents at Chicago's Drummond Elementary School at the February 28 press conference at which they announced that the majority of teachers at Drummond were boycotting the administration of the ISAT tests. Left to right above, Anne Carlson (Drummond teacher), Jesse Sharkey (Vice President, Chicago Teachers Union), Juan Gonzalez (Drummond teacher), Mary Zerkel (Drummond parent), and Cassie Creswell, a parent leader of the group "More Than A Score." Substance photo by Sharon Schmidt.The announcement confirmed that a majority of Drummond 3rd through 8th grade teachers had voted to boycott the ISAT in March 2014. At the press conference in front of the school, the teachers were joined by parents, students, community leaders, and union officials who support their decision. The Drummond teachers join teachers from Maria Saucedo Elementary School, who voted earlier to boycott the tests. Both Drummond and Saucedo are among the highest ranked CPS elementary schools. Despite the fact that the ISAT tests are being ended by the state of Illinois, Chicago Public Schools officials have scheduled ten full school days for the ISAT and have threatened children, parents, principals and teachers who oppose the waste of time exemplified by the program. In addition to the schools that have announced the boycott, hundreds of teachers have been informing parents and children that they have the right to refuse to take the ISAT (and other so-called "standardized" tests) since the beginning of February. The organizing against the over-testing has been done by several parents and community groups, including "More Than A Score," a Chicago group, and by the Caucus Of Rank and file Educators (CORE), the caucus that leads the Chicago Teachers Union. Union officers including President Karen Lewis and Vice President Jesse Sharkey have also spoken out public in support of the opt outs and boycotts. The Drummond teachers told the large number of reporters who came to the school that they were well aware that they may face serious professional consequences when they begin their actual act of conscientious objection on Monday, March 3. Threats from CPS administrators have been published in the press and also conveyed through the school system's crumbling administrative infrastructure. Throughout the week, Substance has been receiving reports that principals have been ordered to threaten teachers and parents with dire consequences if they refuse to take or administer the ISAT, despite the fact that the test is being ended by the State of Illinois. 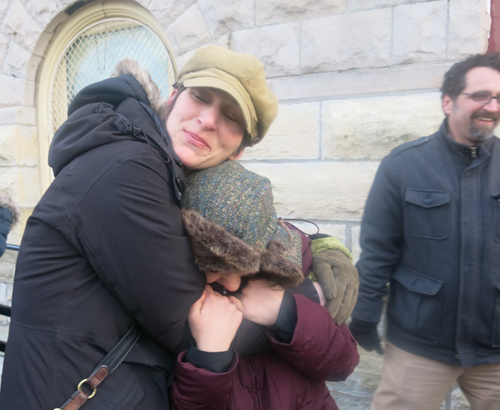 Drummond teacher Anne Carlson hugs a supportive student at the February 28, 2014 press conference.In a February 27 email, the CPS "Chief Executive Officer" Barbara Byrd Bennett said that she wanted the teachers to lose their Illinois teaching licenses if they refuse to administer the tests when ordered to do so. At a hastily called "Webinar" for principals across the city, CPS officials went over a series of threats against children, parents, teachers and principals in the face of the growing boycott of the ISAT in Chicago. Confused and often illegal threats had been coming out of CPS administration for more than two weeks, since the opt out movement "Ice the ISAT" began expanding among parents and children, with accompanying attempts by officials in the nation's third largest school system to muzzle school workers and gag reporters who have been trying to cover the stories that have been breaking new every day. [See related "First Amendment? Not In Chicago Public Schools!" story at substancenews.net thttp://www.substancenews.net/articles.php?page=4848§ion=Article]. 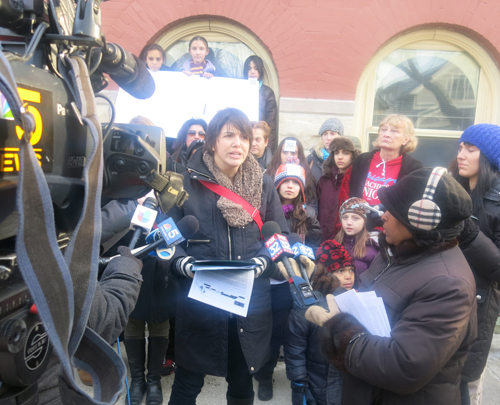 Cassie Creswell of More Than A Score speaking to reporters during the February 28, 2014 press conference at Drummond Elementary School in Chicago. Substance photo by Sharon Schmidt.I am speaking on behalf of More Than A Score, a coalition of Chicago parents, teachers, and students fighting against the misuse and overuse of standardized testing in the Chicago Public Schools. Putting children in a position that requires disobeying their teacher�the adult that their parents entrust them into the care of every school day�is wrongheaded and abusive. Pressuring children, some as young as eight years old, to participate in activities against their parent or guardian�s wishes is unethical and immoral. The argument that schools must administer the test because it is the law does not trump a parents� decision of what�s best for their child. There has been a law in Illinois that children in elementary schools should get daily PE classes, but that law has been ignored by CPS officials for decades. There are federal laws are supposed to protect kids who require medical or special education services at school, and there are children in this district who are not getting those services. CPS has said that the district may risk losing Title I funding due to testing opt outs. There is no evidence that this is the case. We have reviewed the US Code and the Code of Federal Regulations and found no references to automatic funding cuts for failure to make Adequate Yearly Progress. This district has not made AYP since at least 2005. Only 64 CPS schools made AYP last year. If there were any cuts, they�ve happened already. During the ISAT testing window, we fully expect principals and teachers�the adults whom we entrust our children�s care to every day of the school year�to treat our children with kindness, to allow them to engage in alternative quiet activities during the test, and to respect our wishes as parents and guardians to direct our children�s education. The Illinois Federation of Teachers has also voiced their support for educators who refuse to administer the ISAT, including the more than 40 teachers at Saucedo that voted unanimously against giving their students the test. The email from the Troll who was calling himself "Eddie Vedder" has been deleted from Substance comments. Our policy is to email anyone about whom we are suspicious about when we hear from them for the first time. We also DELETE anyone who publishes using anonymous and pseudo-nonymous stuff. We police the site every night. Anyone who wishes to post using his or her own name is free to make a comment, but trollacious attacks, anonymous, and pseudo-nonymous stuff is deleted.